I’m going to get up onto my soapbox and rant a little. Friends. Movember is drawing to a close, and I thank you all for your support, financial and otherwise. And for those of you mocking me for growing such a glorious Mo, well, you’re just jealous. But there’s more to Movember than just growing a Mo. There’s the issue of Men’s Health, which sometimes gets lost in the messaging. While women are very proactive and supportive of women’s health issues, men have a level of indifference that is concerning and don’t seek out help (see references below). One of the major reasons Bros don’t seek out help is due to embarrassment. Why? Because we’re afraid of being made fun of? Because we figure if we ignore it it’ll “just go away”? Because we don’t want to appear “weak”? The consequences of not seeking help could include cancer, depression or worse. What’s weak about tackling those issues? Those are incredibly tough things to deal with – if anything they require more strength. If you’re a Mo Bro, get your annual physical. Get checked out. Go see the doctor if you need it – don’t wait. Talk to a healthcare professional if you need it, and make an informed decision on your future. Many health issues are curable and treatable if caught early – the longer you wait the worse they can get. For all the Mo Sistas and Mo Bros out there, support your Bros. Mo Bros are likely to put off seeing the doctor and ignore health concerns, but with support this attitude can shift. We’ve all had a good laugh over this month, and it’s a fun month for sure. But let’s not forget the serious health consequences that this month highlights. For more information, check the Movember page on Men’s Health Issues. Thanks to Michelle D for the idea for this post and Vanessa V for feedback. Tudiver F, Talbot Y. Why don’t men seek help? Family physicians’ perspectives on help-seeking behavior in men. J Fam Pract. 1999 Jan;48(1):47-52. Winerman, L. Helping men to help themselves. Available online. A great post illustrating selection bias using the 2012 US Election and Twitter. 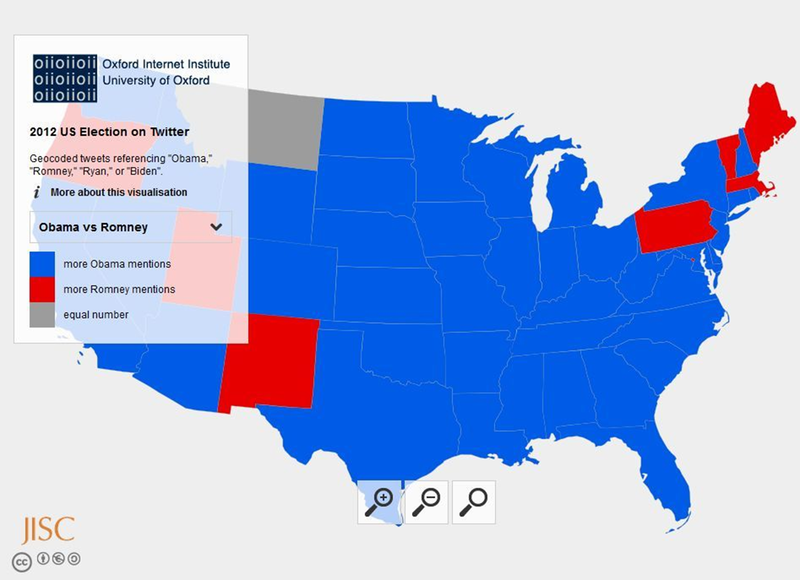 According to the Guardian Data Blog, Obama is heading for electoral success, on the basis of a Twitter-based analysis. It’s all very nice to see mapped out, and the use of geocoding is cool (though possibly flawed), but underlying the approach is a massive potential for selection bias. The problem is quite simply this: if Democrat supporters use Twitter more frequently (or are more likely to tweet about their political preferences) than Republicans, then the number of tweets supporting Obama over Romney is of course going to suggest that Obama is in the lead. On the other hand, if Republicans are more Twitter-active than Democrats, then there could be an underestimation of the level of support for Obama. Essentially, we’ve got a reasonable estimate for a numerator, but no clue about the denominator. At some point in your graduate education you’ll have to ask for a letter of reference. It might be for a funding application (see my previous post) or it might be for another program (med school, law school, PhD programs etc). But you’ll need to ask people to write wonderful, glowing praise for you in their free time. Which is a daunting, and intimidating task. But the good news is that your profs and supervisors are expecting this. They’ve done it before, and know the process. So don’t be afraid! And of course, because it’s me, I’ll bringing in a friend to help with the post. So without further ado dear readers, Liz Lemon.